DRUG addicts would be given electrotherapy to help them kick the habit, under new plans being considered by the Scottish Executive. The controversial treatment sends electric pulses through the skull to help stabilise the brain after quitting "cold turkey" and help to control the body's cravings. One patient who underwent a five-day course of neuro-electric treatment has since been drug free. Jack McConnell, the First Minister, is reportedly so impressed with the anecdotal evidence, that he has asked Scotland's Chief Medical Officer to look into the issue. David Liddell, director of the Scottish Drugs Forum, welcomed a controlled study but warned against seeing the new treatments as a "magic bullet". Please do not confuse Electro-Stimulation Therapy (EST) with Electro-Convulsive Therapy (ECT). EST has been used for treatment of everything from arthritis to migraines for some time, & I'm aware of at least one addiction unit South of the border that has been using it with some success for some time. EST uses tiny bursts of electricity & is completely harmless, whereas ECT is used as a last resort in severely depressed psychiatric patients, uses enough electricity to induce an epileptic seizure (under general anaesthetic, & with muscle relaxants), & can have some severe side effects if over-prescribed, or if the patient is unlucky. 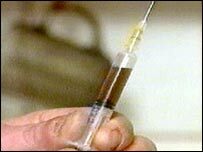 A drug addict who was on heroin for five years has claimed he has been cured by a revolutionary treatment. Barry Philips, 24, from Kilmarnock, said Neuro-Electric Therapy, which sends electric pulses through the brain, had made him drug-free. He said the treatment enabled him to come off heroin in only five days. The Scottish Executive is now backing further research into NET which was being discussed at a conference in Kirkcaldy on Friday. Ken Barrie, director of Alcohol and Drug Studies at Paisley University, said the treatment could be used as a first step. However, drugs expert, Dr Laurence Gruer, director of public health science at NHS Health Scotland, urged caution, saying NET appeared to treat withdrawal symptoms rather than the addiction itself. During Neuro-Electric Therapy (NET), self-adhesive electrodes are applied behind the ear. A pocket-sized stimulator is used continuously for six to 10 days and pulses an electric current through the brain to help stabilise its natural balance. NET is said to reduce cravings of drug users within one or two weeks. Mr Philips said he had tried four times without success to come off heroin, using both methadone and cold turkey. He said his withdrawal symptoms lasted for a much shorter period when he used NET and he had remained clean since the treatment in February. "It was a lot faster than any other 'rattle' I've ever done," he said. "Within four days I was sleeping - a full night's sleep, which was really surprising. "Within five days I was really starting to get better and on the sixth day I never even needed the box - that was when I was feeling totally fine again. "I've not even thought about drugs - not just heroin, anything at all." Independent drugs expert Professor Neil McKeganey, of the drugs misuse research centre at Glasgow University, said NET was worth a proper study. He said: "One of the reasons it's terribly difficult for addicts to get off these drugs is the cravings are very strong. "One of the benefits of NET, at least as it has been claimed, is that it allows addicts to cope with those feelings of cravings." However, Prof McKeganey warned that it was not a long-term cure and addicts needed continuous support to ensure they remained clean. He also said fundamental questions needed to be asked before making NET more widely available. Drug charity The Third Step carried out the trial with Mr Philips. Dr Gruer said the treatment was a first step but appeared to only deal with withdrawal symptoms. "I think this is in the same ball park as acupuncture which produces some stimuli which stops the brain from feeling so raw and bad," he told the BBC's Good Morning Scotland programme. "We have to be rather cautious about being too optimistic about this particular approach. "It may help one or two people but whether it helps a large number is another matter." Mr Barrie told the programme: "It is worth pursuing anything that's going to assist people to make changes. This is clearly an early stage in the process. "We would also need to look further on into the processes, the social support, the psychological support, which people need in the longer term to cure their addiction." The executive is giving support and advice to set up a clinical research project in an effort to see if the treatment is valid for a much wider sample of addicts. Mr Philips said he was positive about his own future. "I just hope it continues to be like this, back to feeling amazing again, waking up with a smile on my face," he said. Mr Philips was describing his experiences at a conference at St Bryce Kirk, Kirkcaldy, on Friday. Other speakers included Prof McKeganey and George Patterson, the widower of the surgeon whose work in the 1970s helped develop NET. A Scottish Executive spokesperson said: "The first minister noted the anecdotal evidence of benefit of the therapy. "However, any decision on the way forward would have to be based on clear, scientific evidence of the treatment¿s biological effects. "The next step is that they should prepare a research proposal, which will then be considered by independent scientists. "If they are convinced by the research proposal, then consideration may be given to a pilot." Being a student of all tools of consciousness alteration, SWIIB happens to have a Cranial-Electro Stimulation (CES) device. SWIIB reports it is a fun toy and in no way painful unless you really crank the voltage up. Similar devices have apparently been used in some countries for years to treat addictive disorders (overeating, drug dependence, etc.). The theory is roughly that the stimulation causes an increase in the production (release?) of various neurotransmitters and will reduce the need for alternate methods of stimulating neurotransmitters. Both the voltages and methods are very different from ECT. Just be careful if you start getting wacky about mixing psychotropics and CES… or you might just end up with strange book on your hands.